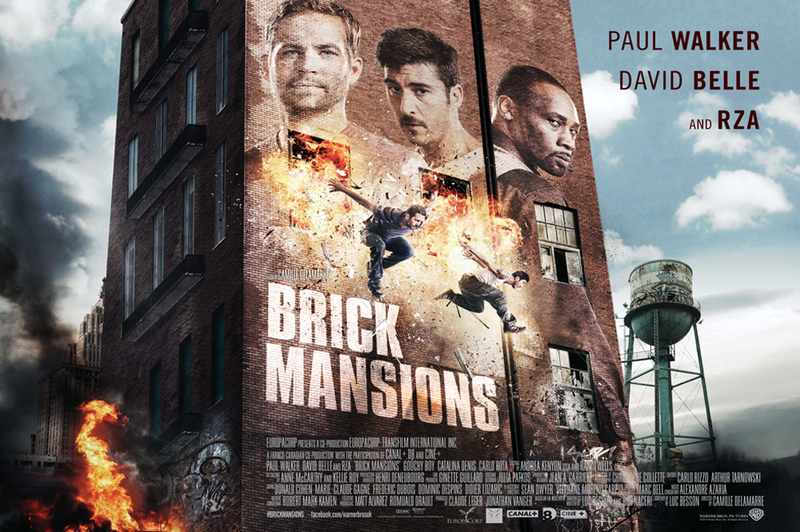 In the not-too-distant future, Detroit has erected a wall around an area known as Brick Mansions. Ruled over by crime boss Tremaine Alexander (RZA), this ghettoised area is full of drugs and guns and gang members (but not, it seems, any ordinary folk). When the Mayor (Ramsay) decides that Brick Mansions has to be replaced by a brand new commercial development, he concocts a plan that involves sending undercover cop Damien Collier (Walker) into Brick Mansions to retrieve and “disarm” a hijacked bomb that could destroy the entire area. On the inside, Alexander is having his own problems. One of his drug shipments has been stolen by Lino (Belle) (and for no other reason than because the script needs him to). When Lino proves too elusive to capture, Alexander has his ex-girlfriend Lola (Denis) kidnapped in retaliation. He tries to rescue her but ends up in jail where Collier engineers a meeting with him and then tries to use him as a way of finding the bomb. They form an uneasy alliance, and go after Alexander and the bomb together. As unnecessary remakes go, Brick Mansions gets by on its high-impact action scenes – expertly crafted and assembled by Delamarre and the movie’s stunt team – and the still impressive parkour abilities of Belle (who starred in the original movie, Banlieue 13 (2004), and doesn’t look a day older). Beyond these elements, though, the movie pays lip service to plotting, characterisation, consistency and credibility, and merely jumps from one action sequence to the next with a minimum of fuss or subtlety. The performances range from so-so (Belle, who has only the one facial expression) to trying (Walker, unable to create a character out of nothing), to embarrassing (RZA – when will someone tell him he can’t do menacing?). The rest of the cast struggle with roles so under-developed they don’t even reach the level of being generic, and Luc Besson’s script (adapted from his co-written original) further handicaps everyone by relying on the kind of dialogue that sounds like it’s been badly translated from the original French. While it’s true that Banlieue 13 isn’t perfect, it’s still the much better movie, and all Brick Mansions does is prove it. Rating: 4/10 – a movie where acting was clearly not a requirement, Brick Mansions revels in its many patent absurdities; as brain-dead a movie as you’re likely to see all year but saved from being a complete loss by its well-staged action sequences. With the Eighties being increasingly plundered for material that can be remade, rebooted or re-imagined, the likelihood of a new RoboCop movie was always a strong possibility. Now that it’s here, it’s inevitable that the comparisons between this version and Paul Verhoeven’s 1987 original are appearing thick and fast, with equally inevitable results: it’s not the same (shock! horror!). From the black suit to the addition of a wife and child, RoboCop is – and was always going to be – a different beast from its predecessor(s) (let’s not even mention the animated and live action TV series’). Some things remain the same though. Alex Murphy (Kinnaman) is still a Detroit cop, working with his partner, Jack Lewis (Williams) to bring down crime boss Antoine Vallon (Garrow). When the pair get too close, Lewis is wounded in a shootout and Murphy is subsequently blown up outside his home. With his life hanging in the balance, OmniCorp boss Raymond Sellars (Keaton) offers his wife Clara (Cornish) a way to keep Alex alive: sign up to their research programme, headed by Dr Norton (Oldman). Three months later, Alex is restored to waking consciousness to find himself encased in a metal suit and horrified by what is happening to him. 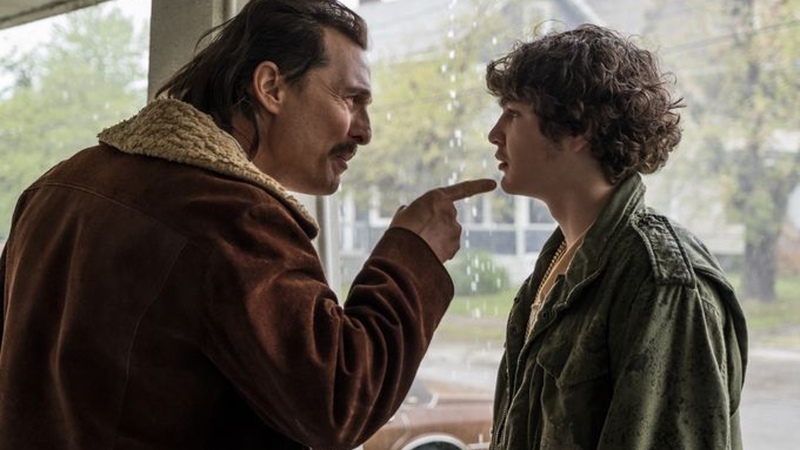 After an escape attempt fails he begins to accept the reality of his situation and works with Norton to make the best of things and, more importantly, find his way back to Clara and his son David (Ruttan). With a projected annual return of $600 billion if their robot police programme is a success – and if a bill banning robot police officers is repealed by the Senate – OmniCorp is determined not to let Alex’s individuality ruin their investment. They take steps to control his emotional and judgmental responses, but reckon without his love for his family – and his need for revenge on Vallon – overriding their protocols. Soon, Alex begins to understand the depth of Sellars’ duplicity, and with his partner’s help, sets out to – yes, you’ve guessed it – bring Sellars to justice. 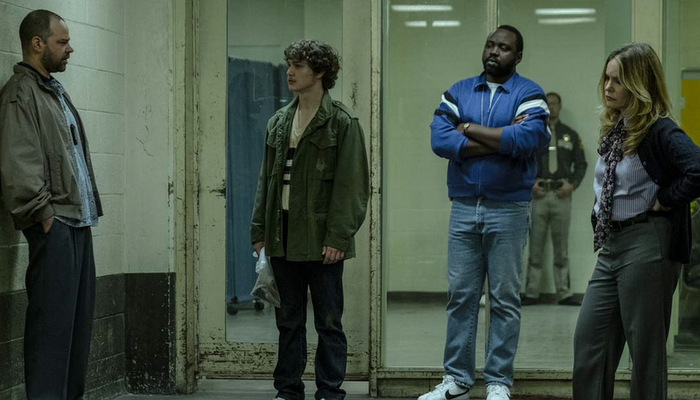 Although Ed Neumeier and Michael Miner – the screenwriters of the 1987 version – are credited alongside newbie Josh Zetumer, little remains from their script except various names, the Detroit location, and the movie’s basic structure. It’s not a bad (exo-) skeleton to hang things on and ensures the movie doesn’t stray too far from the (in-built) audience’s expectations. 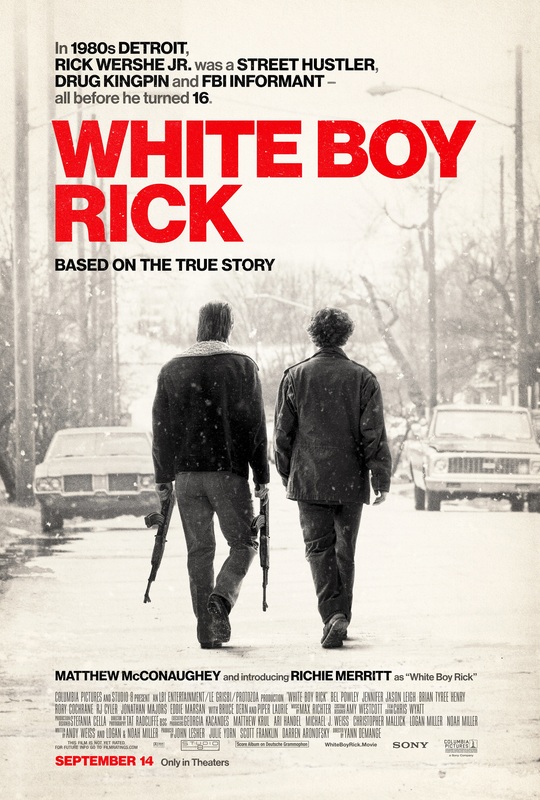 The major difference here is that Alex isn’t killed but is critically injured, making his memories and emotions a much more potent angle to explore… except the movie doesn’t. With the exception of a brief (read: cut short in the editing process) scene where Alex goes home for the first time as RoboCop, there’s no real exploration of what Alex might be feeling beyond having Kinnaman look aggrieved for a few moments in-between the action elements. With all this dialogue and by-the-numbers plotting, how then do the action scenes fare? 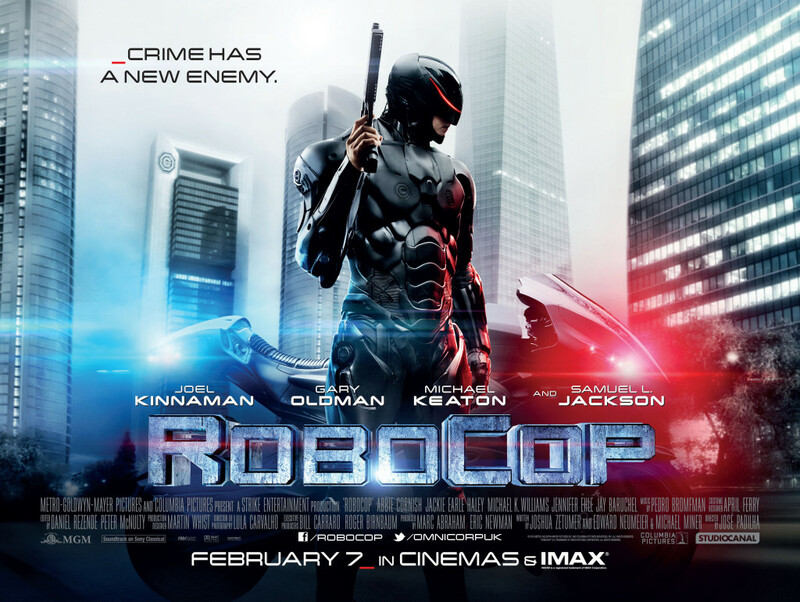 Well, one first-person shooter sequence aside (which sticks out like a sore thumb), RoboCop delivers fairly effective if unexceptional action beats until it wimps out altogether and gives us one of the most ineffectual showdowns in action cinema history (look for the well-armed guard who doesn’t fire a shot – no, look for him: once RoboCop appears he all but vanishes). And if I have to make one comparison only between this version and the 1987 movie, it’s that Vallon is a poor, practically disposable villain when set against Clarence Boddicker. The cast perform efficiently enough and Kinnaman makes for a strong-jawed hero, while Oldman does his best with a character whose motivations change from scene to scene (and sometimes within them). Keaton underplays Sellars and only occasionally shows off the nervous energy that made him so exciting to watch earlier on in his career, and Baruchel gets to play the annoying marketing character you hope gets killed by an ED-209. As Clara, Cornish has little to do but look angry or upset from the sidelines, and Jean-Baptiste (so brilliant in Mike Leigh’s Secrets and Lies) is here reduced to treading water until her character is no longer required by the narrative. Padilha directs with an efficiency and a drive that never quite translates into sustained tension, and there are too many filler shots of RoboCop zooming through the streets of Detroit on his customised motorbike. That said, there are things to like: Lula Carvalho’s steel-burnished photography; Murphy’s treatment of hired mercenary Mattox (Haley) after a training exercise; a short scene where a man with robotic hands plays the guitar; Mattox’s choice of music during Murphy’s first training session (plus Norton’s bemused response); the seamless special effects, a predictably vast improvement on 1987; and the movie’s best scene by far: the moment when Murphy discovers just how much of himself fills the suit. 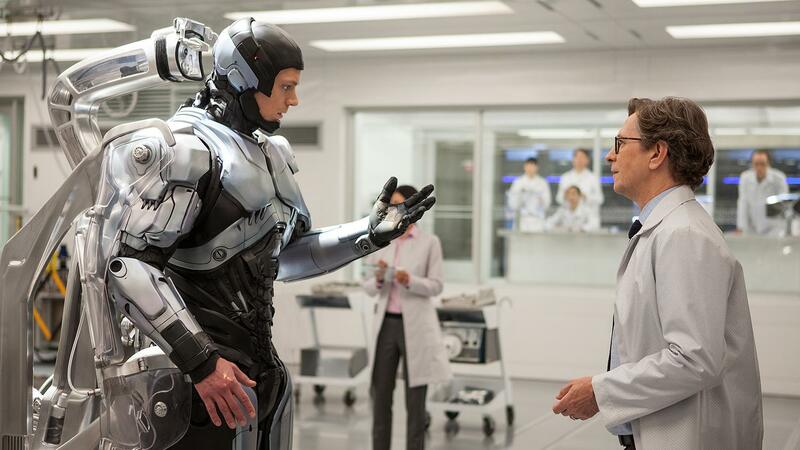 Ultimately, what’s missing from RoboCop is a clear attempt at relating the emotional trauma of being a man in a “tin suit”. Without it, RoboCop doesn’t engage in the way it should do, and many scenes pass by without having any meaningful effect on the audience. It makes for frustrating viewing, and robs the movie of any real drama; sadly, it all ends up being just too impersonal. Rating: 6/10 – a tidier script would have helped but this is by no means a disaster; a shaky start to a new series of movies(?) but enjoyable enough despite its flaws.